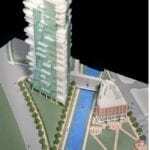 A conceptual aerial view of the Bell Park tower and office. 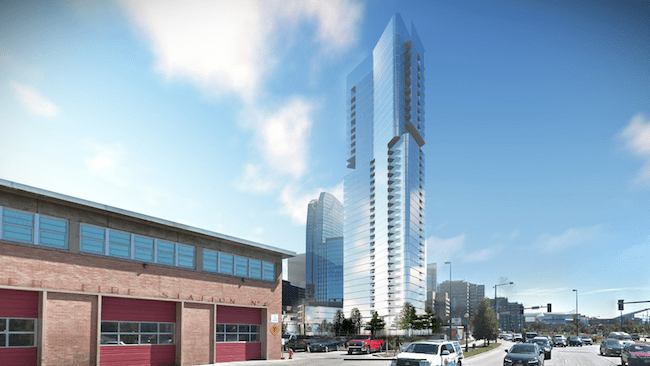 The Bell Park development saga to create an iconic residential tower at a gateway to downtown Denver continued last week. Buzz Geller, whose Paradise Land Co. owns the historic triangular site along Speer Boulevard, Market Street and Cherry Creek at the edge of Lower Downtown, last Thursday presented the latest proposal for the site to the Lower Downtown Design Review Board. 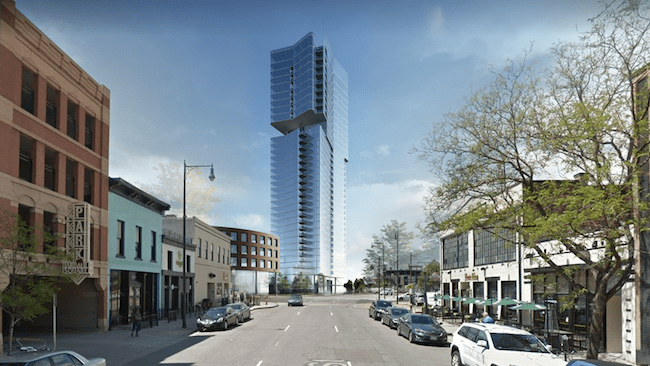 Architect Stephen Droll also discussed and presented a preliminary massing design at the information-only meeting for a 36-story residential tower and a five-story office building on the site. 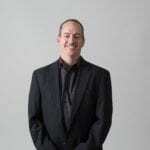 Droll is principal of Chicago-based Valerio Dewalt Train Associates. In addition to Chicago, VDTA also has offices in Denver and Southern California. 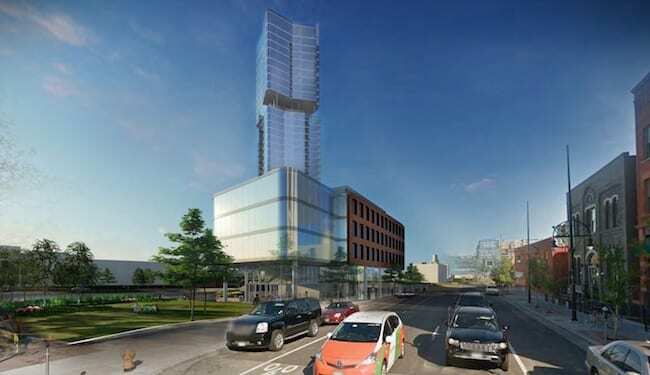 Droll represents Kairoi Residential, which will develop the 36-story residential tower. The LDDRB took no action following the two-hour meeting, as the purpose of the hearing was only to gain information and open a dialogue with Geller and Droll. At the hearing, city planner Brittany Bryant said the city staff had some concerns with the most recent proposal. The city staff, for example, is concerned that the maximum floor plate of 7,500 square feet may have been exceeded in the proposed tower. Another concern is that portions of the tower may be beyond the buildable area. A conceptual rendering of Bell Tower. The rendering is meant only to convy mass, form and scale of the tower. Source: Valerio Dewalt Train Associates. Later, several board members said the potential problems raised by Bryant may need to be decided by zoning and not LDDR. That surprised Geller, as the city agency in charge of zoning already reviewed the latest proposal. There is no other site like Bell Park in Denver. In addition, “This block is unique as the only site bisected by Cherry Creek, overlaid by the Mountain View Corridor, the site of Denver’s ’s Old City Hall, and adjacent to Larimer Square,” according to Bryant. The site gets its name from a historic bell tower on the land that had been home to Denver’s original city hall building. In an interesting twist, Geller pulled the plug on an earlier tower on the site, part of a $300 million project, in November 2008, as the economy entered the Great Recession and he couldn’t get approval from the Lower Downtown Design Review Board. A rendering of what Fentress Architects proposed for Bell Park more than a decade ago. Geller’s original plan called for Denver architect Curt Fentress to design what arguably would have been Denver’s most distinctive building, if it had been built. At that time, a Rocky Mountain News editorial, perhaps using a bit of poetic license, pilloried the board. “The process is open-ended and Kafkaesque: (Geller) can only guess at what will satisfy the design review committee, or whether anything would,” according to the November 2008 newspaper editorial. However, even if the editorial was on target, that doesn’t mean today’s board is as hard to please. In fact, not one person who served on the board in 2008 remains on it today. Last Thursday, Geller repeatedly asked board members whether they liked the current proposal and sought input on what would make it better. A look at Bell Tower from Market Street. Source: Valerio Dewalt Train Associates. He repeatedly was told that they aren’t allowed to offer personal opinions, but are mandated to make decisions and recommendations on what is allowed under the PUD and the Historic Urban Edge District and Lower Downtown Historic District principles, when they apply. Another board member later said the office building looks like it could be built in the Denver Tech Center. 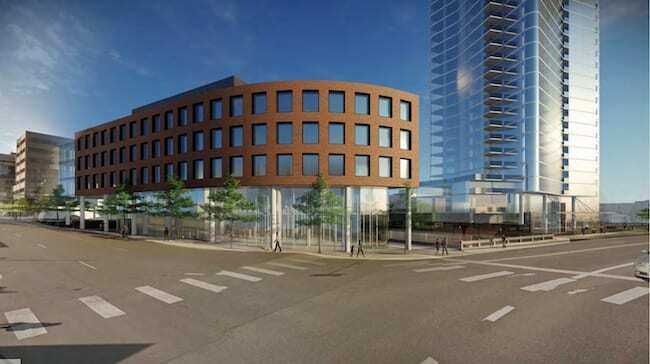 Architect Tania Salgado, the chairwoman of the board, suggested that Geller and Droll study the “rhythm and movement” of streets in LoDo and return with a design that provides a transition to LoDo with the office building as well as a refined gateway tower. 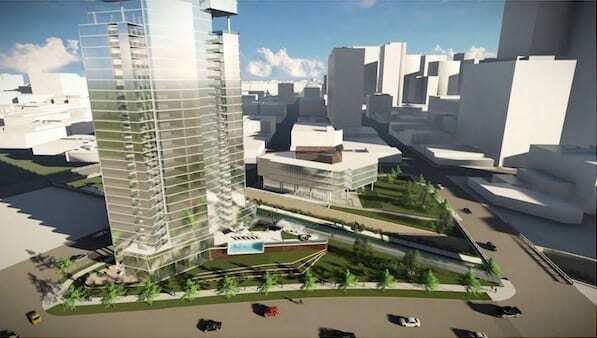 A conceptual rendering of the office buildng and tower proposed to be built at Bell Park. Source: Valerio Dewalt Train Associates. Geller noted that the two new buildings must be “of this time “ and must complement each other. “It has to look like one project,” Geller said. The meeting was only the latest chapter of the evolution to build on the Bell Park site. Geller first acquired the property almost 15 years ago, when he swapped land with the city to build the Justice Center that includes a jail and courtroom on West Colfax Avenue. 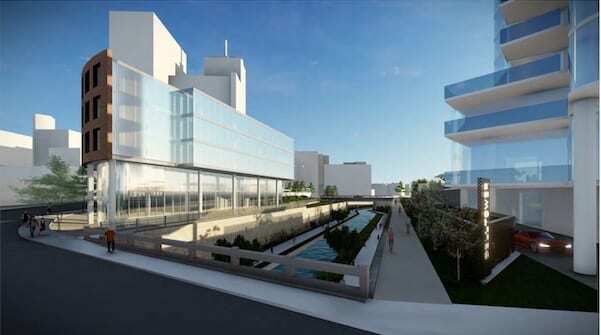 Another conceptual view of the Bell Park site’s proposed tower and office building. Source: Valerio Dewwalt Train Associates. Kairoi plans to develop the tower under guidelines created by the PUD. “This site has everything we are looking for,” Jim Bruner, executive vice president of development for San Antonio-based Kairoi, said just before the hearing began. 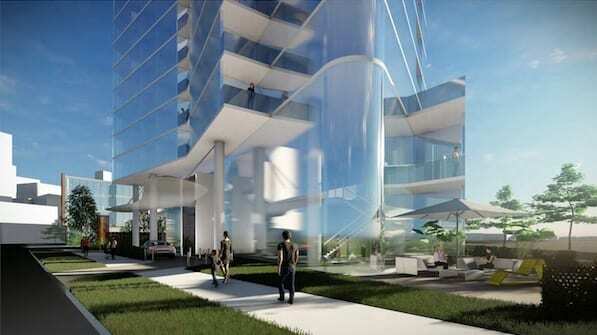 It will either be an apartment or a condo tower. “At this point, we just know it will be residential,” Bruner said. This map shows where Bell Tower would be built. If it is built, the building will comply with Denver’s new green roof ordinance. “Our architect has studied the green roof ordinance and is very familiar with the requirements,” Bruner said. 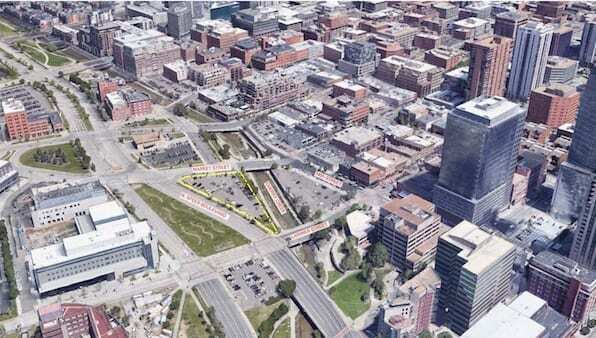 The current plan has been endorsed by several nonprofit and neighborhood groups, including the LoDo District Inc. and the Downtown Denver Partnership. “After review, we believe the development team has done exceptional work in both honoring the spirit and interest of the PUD and thoughtfully providing current-day solutions for deferred items,” Fabby Hillyard, co-chairman of LoDo District Inc., wrote in a letter Dec. 17. A conceptual view of Bell Park from Larimer Square and the Bell Monument, looking north. Source: Valerio Dewalt Train Associates. View from Market Street at Cherry Creek, looking south. Source: Valerio Dewalt Train Associates. 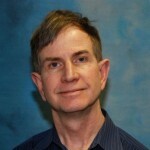 Bruner said he is not aware of any opposition to the proposed tower and office building. Geller initially sought he PUD because he felt the “use by right,” would allow buildings that would block the views from nearby Larimer Square. Since Denver overhauled its zoning rules in 2010, it seldom approves PUDs. 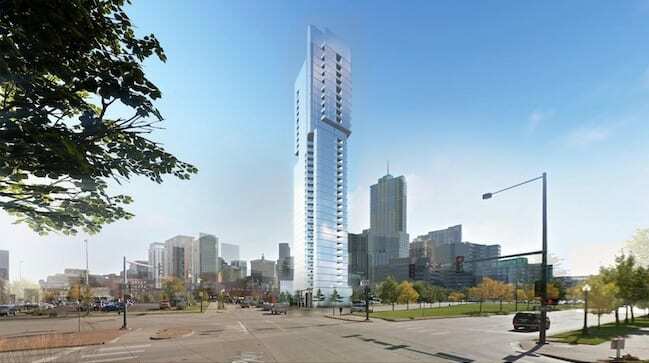 However, anyone who is hoping to see Denver’s skyline to change with a new gateway tower will need to be patient. If all goes well, the earliest the Denver City Council would consider the development would be this summer. And once approved, it will take 2.5 years to three years to build. The site is small and it will be complicated to build a tower on it, Bruner noted. 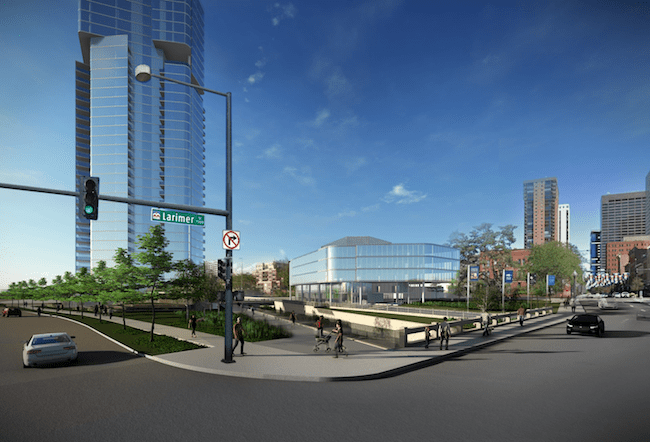 Also, it will have three levels of underground parking, next to Cherry Creek. “That doesn’t make it any easier,” he said. However, there is one thing that all of the parties agree on. “This is an exciting project,” board member Salgado said. A conceptual view of Bell Tower along Market Street. Source: Valerio Dewalt Train Associates.